Network Bandwidth Monitor made easy. Deep-dive into bandwidth usage patterns with bandwidth analyzer. Network administrators have a lot on their plates. They're asked to not only track all the bandwidth consumed in the network, but also to maintain policies that allow smooth access to business-critical applications. While asking ourselves what we could do to make your job as a network administrator a little easier, we realized it's crucial that you are able to visualize what's happening in the network so you can understand and resolve whatever's causing network slowness. NetFlow Analyzer is a flow-based bandwidth monitor tool that helps you monitor your network's bandwidth usage in real time. 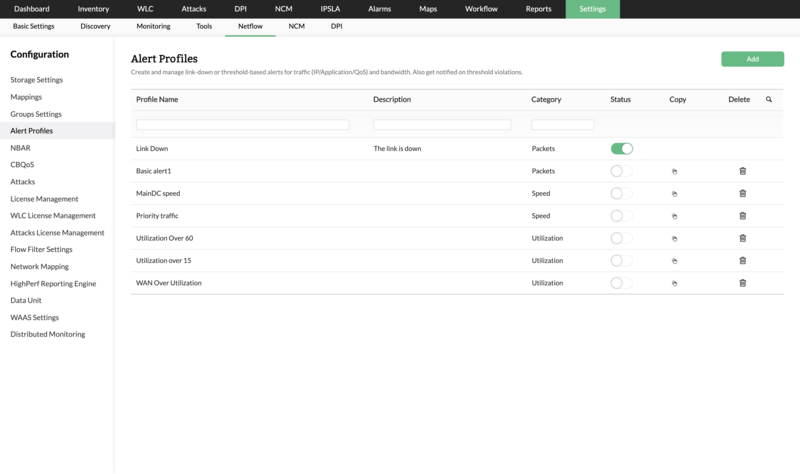 Flows exported to NetFlow Analyzer will help you understand which applications are consuming the most bandwidth, the top talkers in the network, and measure network bandwidth usage at any particular time. A real time bandwidth monitor tool can help you resolve the issues on time before end-users are affected. NetFlow Analyzer also helps you identify and avoid bandwidth delays with customized reports that can search for specific bandwidth usage details such as applications, IP address, host name, protocol, and more. Apart from these bandwidth reports, NetFlow Analyzer's bandwidth monitor also lets you control bandwidth to limit the consumption of bandwidth-intensive applications. 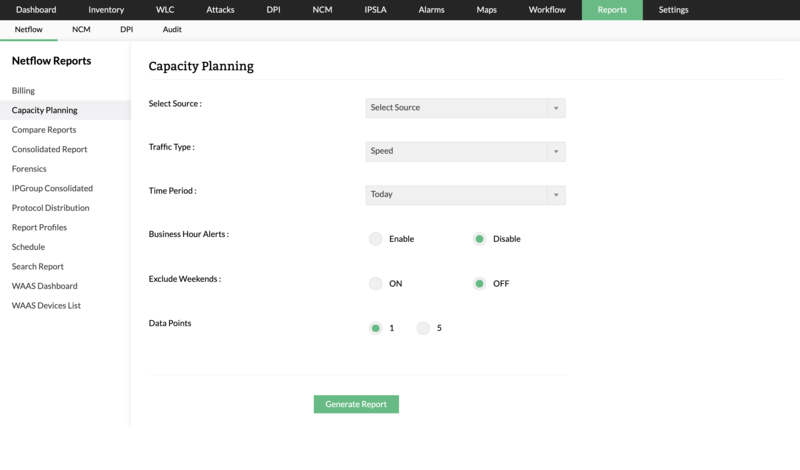 Even though keeping track of all the activities in the network and managing them is a herculean task for any organization, NetFlow Analyzer can make it easy. Identify bandwidth usage by interface, application, and conversation. Highlight the top talkers in your network. Follow historic bandwidth trends for capacity planning. Get instant threshold-based alerts in case of an emergency. Find the root cause behind bandwidth issues and resolve them on time. Classify interface and application bandwidth consumption. 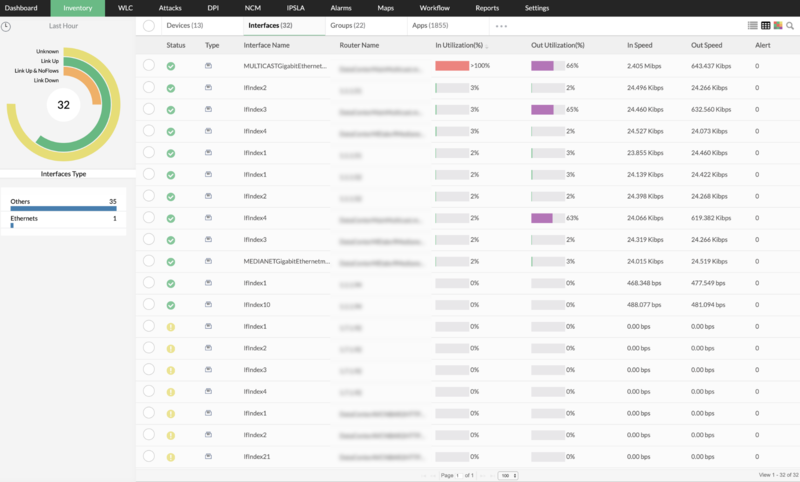 NetFlow Analyzer classifies and categorizes traffic by applications, interfaces, protocols, and hosts to generate instant visibility into bandwidth usage. Find out when your bandwidth is high, which applications are using the most bandwidth, and who is using the most bandwidth with graphs. The bandwidth usage monitor can also help you to drill down to see the consumption of the top sources, destinations, and conversations for detailed analysis. With such granular detail, network troubleshooting and problem resolution take far less time than with traditional bandwidth monitor software. Know who the top talkers are with real-time bandwidth monitoring. NetFlow Analyzer's customizable dashboard includes a real-time traffic summary that helps you identify the top talkers in your network. With these bandwidth usage statistics you can get instant visibility into top bandwidth utilization by hosts, applications, and conversations across a specific interface. To drill down further, bandwidth monitoring reports for each interface show the current, average, and peak bandwidth usage patterns across each flow-enabled interface. A bandwidth monitor tool will help you find the who, when and what of network traffic and troubleshoot bandwidth issues. Plan future bandwidth needs with usage trend patterns. NetFlow Analyzer's bandwidth monitor allows you to view bandwidth usage over a period of time. Bandwidth monitoring trends show the usage patterns and traffic trends across a day, week, month, or year. With these kinds of statistics in hand, a bandwidth monitor tool can help you can analyze how bandwidth is used in your network, and decide if you need to increase your available bandwidth. Set threshold-based alerts to understand the severity of an issue. NetFlow Analyzer allows you to set thresholds for excess bandwidth utilization, and notifies you via email and SMS when the threshold value is exceeded. Create alerts to learn about bandwidth hogs immediately and act quickly. If notifications are set correctly, a bandwidth monitoring tool can help you save your network from sudden traffic spikes. Resolve bandwidth bottlenecks with easy reporting. The consolidated bandwidth usage summary report in NetFlow Analyzer displays the overall percentage of bandwidth utilization and shows detailed bandwidth usage statistics for a WAN link. With customizable reports, you can check the bandwidth usage of any slow link and determine what is responsible for the slowness. You can also drill down to host, application, or conversation details during peak working hours with this bandwidth monitor tool. Helps you understand your network traffic speed and daily bandwidth utilization better with easily customizable graphs and reports. Supports technologies such as Cisco NBAR2, WLAN controller monitoring, deep packet inspection, CBQoS, IP SLA, and more. Saves troubleshooting time with advanced forensics reports. 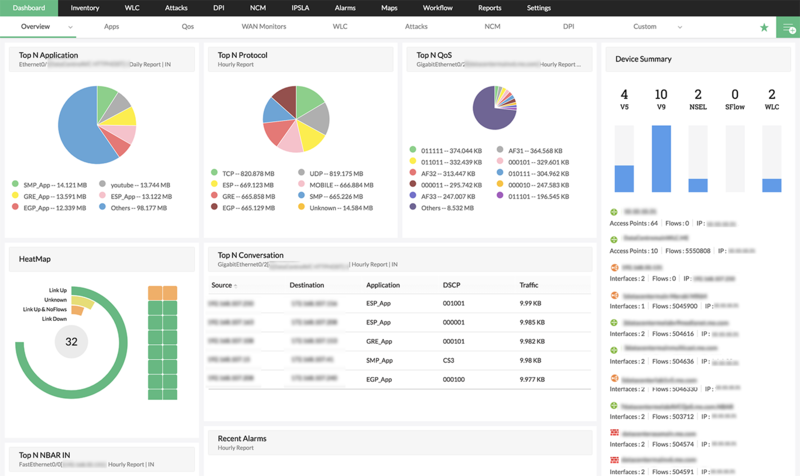 NetFlow Analyzer, flow-based network bandwidth monitoring software, integrates NetFlow, sFlow, JFLow (and more), and other collection and analysis engines. NetFlow exports are collected, correlated, and analyzed by the bandwidth monitor to get granular details to monitor bandwidth usage across each WAN link. With NetFlow Analyzer, there is no need to monitor bandwidth usage with hardware probes, and it is suitable for both Windows and Linux environments. Download a free trial of our real-time bandwidth monitor now! "NetFlow Analyzer is an affordable solution for bandwidth monitoring. We have been using Bandwidth Analyzer to manage our branch and central office bandwidth requirements effectively. It was able to correlate the vast NetFlow data exported from our Cisco Routers and provide us with rich reports that showed us the exact bandwidth utilization based on the type of traffic on the network. 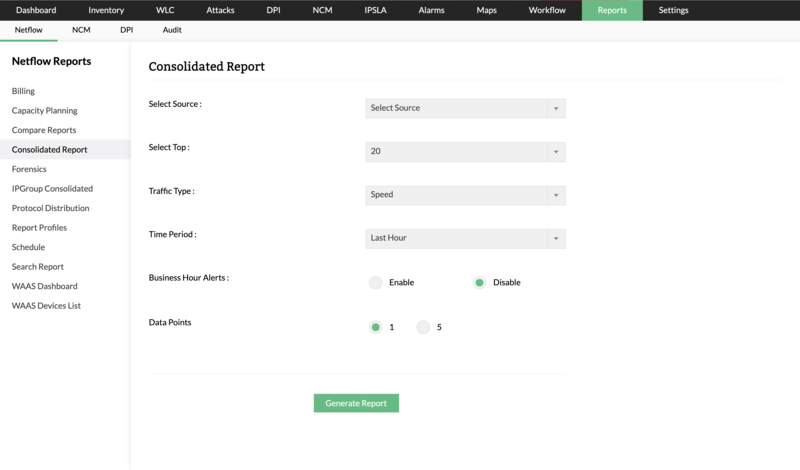 NetFlow Analyzer is an ideal choice for enterprise IT who need to detect network bottlenecks and provide a superior network connectivity experience to their end-users." We have been using NetFlow Analyzer for monitoring bandwidth consumption across the school network spread around 35 sites at Elizabeth, NJ. We have found the product beneficial in capacity planning and in bandwidth related troubleshooting. I would recommend NetFlow Analyzer to anyone looking for a bandwidth monitoring solution.